Logic and reasoning meet Rube Goldberg design with this exciting brainteaser, ideal for classroom free play. 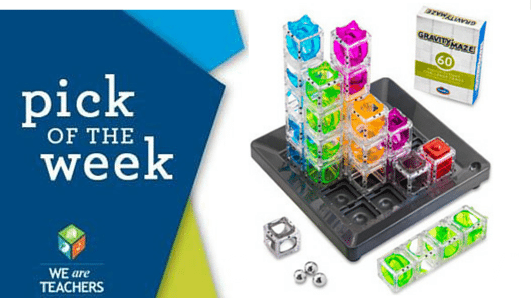 Why we love it: This brand-new marble maze builder is a fabulous addition to your arsenal of indoor-recess and early-work-finisher options. Students select a maze challenge “blueprint” card and follow it to set up differentiated hollow cube towers on a grid. If the student’s tower design matches, a marble will run through from the start position all the way to the target tower. There are 60 challenges, ranging from beginner to expert levels. Go off the grid: The translucent towers also beg to be played with creatively, LEGO-style, and students can flex their logic muscles working to create a successful original maze for their marble. Solo or team: Unlike traditional games that require two or more players, Gravity Maze has no competition structure. Students can take turns completing marble runs or collaborate on completing a maze. Long-lasting: This game can be played quickly and quietly as other students finish their work, or it can occupy students for an entire rainy day recess. Additionally, the playing pieces are sturdy structures that will stand the test of time. What is YOUR favorite classroom free-play game? 7 Ways to Build a Positive Mindset + Test Your Mindset!